A principal custom website design company based in Philadelphia, Pennsylvania, Dynamic Digital Advertising grants clients access to a custom website design and professional website development procedure that merges fourteen well-defined stages of design. Sticking to every one of these steps is necessary for gaining front-page placements on top search engines including Yahoo, Google, and MSN as well as for turning a increased number of visitors into customers or partners. Dynamic Digital Advertisings custom website design process relies on tools such as search engine optimization, planned architecture, competitor marketing analysis, search engine optimization copywriting, and keyword research services, and even comes with post-launch benefits such as web site usability analysis, refined metrics tracking, and secure website hosting options. Presenting one of the most expansive graphic design service lines in the nation, Dynamic Digital Advertising, a top graphic design company, is committed to constructing the advertising media its clients require. Dynamic Digital Advertising uses state-of-the-art digital technology as well as the proficiency of a team of graphic design artists to develop graphic designs for trade show displays, packaging, website storefronts, CD-ROMs and DVDs, posters, truck and bus signs, digital videos, virtual reality tours, and many more. With DDAs graphic designs expertise behind your marketing campaign, your business is certain to reap a higher level of success. Stand out at trade shows. Provide more information. Create an experience. Trade show video production services by Dynamic Digital Advertising are the perfect complement for trade show graphics and trade show displays. From the incorporation of 3D animation, music, live footage, and more, trade show videos help your company command attention on the floor. For trade show video production information, call Dynamic Digital Advertising. Dynamic Digital Advertising’s professional videography team uses digital video recording, editing, and production equipment. Traditional videos are recorded on analog film, then digitized and edited, before being re-recorded onto analog. The digital process remains first generation digital and retains higher picture and sound quality for a more professional final presentation. DDA videographers walk you through conceptualization, storyboarding, scripting, editing, production, and packaging. As a full-service advertising agency, DDA has the ability to provide any type of skill necessary for trade show video production. From scriptwriters to package designers, you have access to top-of-line graphic design talent. Demonstrate products and systems or give tours from the trade show floor. Dynamic Digital Advertising utilizes 3D computer animation, modeling, and more to exhibit to trade show goers how your product works, what your services do, or where your development and manufacturing work is performed. Virtual tours and animated demos provide the competitive edge your company needs to stand above other exhibitors. Dynamic Digital Advertising records trade show videos on CD-ROMs, and DVDs according to the needs of your company and the equipment available at the trade show. Having a trade show video on a variety of media also increases the flexibility of your reps by providing back ups. If you have duplicate DVDs, a broken DVD player is no problem. Clients can simply broadcast the same video via a laptop. Additionally, DDA can replicate or convert older trade show videos onto disc upon client request. Dynamic Digital Advertising can include animated text and characters as well as sound effects, musical clips, and more. DDA maintains an extensive library that allows videographers to set the right mood and tone for a trade show video. Dynamic Digital Advertising provides the resources you need for success at trade shows. Call today to learn more. 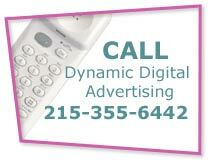 Based in Bucks County in the greater Philadelphia area, Dynamic Digital Advertising commits to providing the cutting-edge technology businesses need. DDA is also proud to be one of the nation’s premier professional custom website design companies. In addition to trade show graphics, print design, photography, 3D animation, and programming, DDA provides website design, website development, and search engine marketing services to a client base that extends from Pennsylvania to New Jersey, Delaware, New York, Maryland, Washington D.C., and the entire United States.